A bride-to-be held a lie detector party to catch out her friend who leaked her weight-based dress code. The bridezilla was left furious when her "former friend" Stephanie told the internet about her upcoming nuptial dress code, that is based on how many pounds you weigh, and has thanked her mates for helping her "identify the snitch". 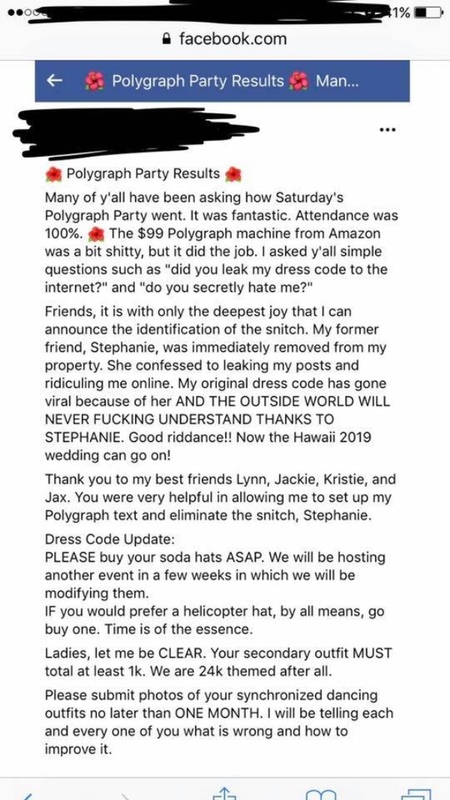 Speaking on Facebook, she wrote: "Many of y'all have been asking how Saturday's Polygraph Party went. It was fantastic. "Friends, it is with only the deepest joy that I can announce the identification of the snitch." The bride revealed that her "former" pal was kicked out of her home right away after admitting to causing online ridicule. She added: "My former friend, Stephanie, was immediately removed from my property.